The E500, our 4.6m Endless Pools Fitness System, provides the ideal swim-spa environment for at-home, total-body fitness. Featuring the signature Endless Pools Swim Current, this swim spa gives you the best swim current on the market. Fully adjustable for every level – from Olympians to octogenarians – the smooth current lets you swim easily in place. The broad, deep current also adds resistance to a range of aquatic exercises for added core engagement. Our Underwater Treadmill (available on the 1.5m H swim spa) lets you walk, jog or run in water's low-impact environment. You'll burn just as many calories, but without the pounding of dry-land activity. The treadmill makes this swim spa ideal for anyone who has (or wants to avoid!) joint pain or overuse injuries. Afterwards, unwind with a soothing hydromassage. 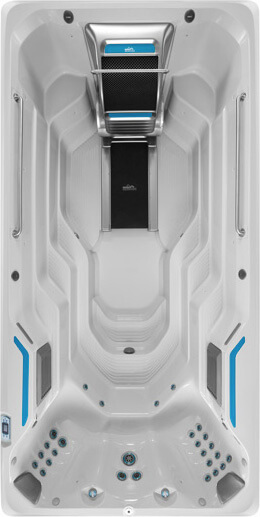 Each ergonomically designed swim-spa seat has a unique configuration of jets – choose the right one to target your sweet spot, or rotate among them for total-body relaxation. The swim spa's durable, steel-framed cabinet has sleek, modern styling that's virtually maintenance-free, so the E500 brings both beauty and functionality to your home. With your choice of options – from a deeper swim spa for chest-deep aquatic exercise to the Underwater Treadmill – you can truly make this swim spa your own. View Specifications.